Nuts, seeds and fresh berries are a wonderful snack. Not only are you nourishing your body with vitamins, minerals and antioxidants, but this snack is also high in fibre and protein, which will leave you satisfied between meals. 1. 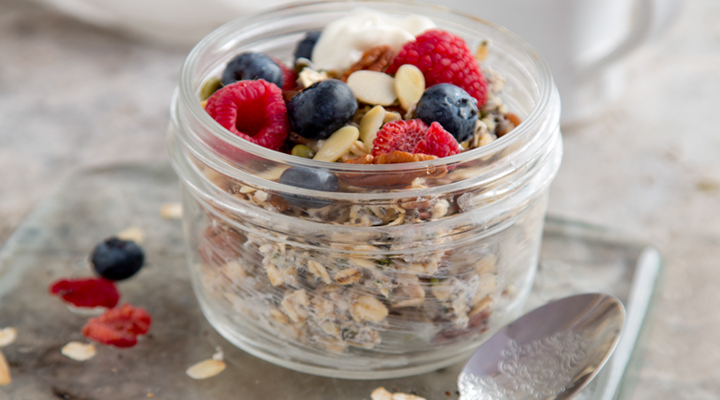 Mix the oats, pecans, coconut and seeds together, then stir in the Greek yogurt. Pour into a pot or jar, then top with the flaked almonds, pumpkin seeds and fresh berries. Eat immediately as a delicious snack or cover tightly with a lid and refrigerate for later. Tip: Make these pots extra tasty by toasting the flaked almonds and pumpkin seeds. Delicious to make last thing at night and to enjoy for breakfast (or even a mid-morning snack at work).